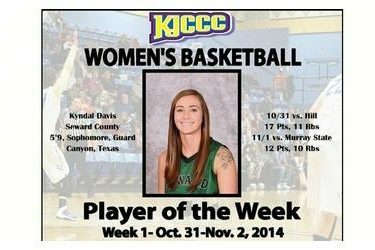 After leading the Lady Saints to back to back wins in the Pepsi Classic to kick off the 2014 basketball season, Seward County sophomore Kyndal Davis has been named the KJCCC Women’s Basketball Player of the Week in a Tuesday release by the league. Davis kicked off her sophomore season in style this weekend at the Pepsi Classic in the Greenhouse, registering back to back double-doubles en route to a pair of Lady Saint wins. Friday night in Seward’s season opener against Hill, Davis scored 17 points and had 11 rebounds in 32 minutes of work while Saturday she went for 12 points and 10 rebounds in a victory against Murray State. On the weekend she averaged 14.5 points and 10.5 rebounds per contest. Davis and the Lady Saints will return to the court Thursday when they hit the road for the first time with a trip to Weatherford, Texas to battle the Weatherford Lady Coyotes.